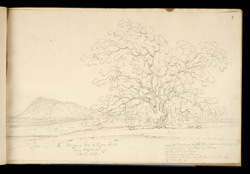 Pencil drawing of a Banyan Tree and Tiger Hill near Hazaribagh, Bihar by Robert Smith (1787-1873) dated November 1813. This is one of 27 drawings (28 folios) of views in Lucknow (Uttar Pradesh) and Sasaram, Hazaribagh and Palamau (Bihar) taken in 1813. Inscribed on the original cover is: 'No. 1. Luknow. Hazaribagh. Palamow' 'etc.' Captain Robert Smith was a military engineer with the East India Company and was in India from 1805 to 1833. He designed a number of buildings in India and also repaired various Indian monuments including the Kutb Minar and the Jami Masjid at Delhi. In 1813 to 1814 he was surveying on the Mirzapur South frontier. The Hazaribagh district is situated in Jharkhand state, east central India on the Chota Nagpur plateau, 2,000 ft (610 m) above sea level. The terrain consists of forested areas, interspersed with grass meadows and some deep waterways. It is the location of a wildlife reserve which supports sambar, nilgai, deer, chital, leopard, tiger, wild boar and wild cat. The town of Hazaribagh (meaning ‘thousand gardens’) grew up around the military Battalion raised by the local rulers, the Ramgarhs about 1780.